I’m not fat…I’m just a little husky! It sounds like something I say every year after the holidays, right before I renew my gym membership and start working on my six pack…urummm….I mean my mini keg. However, this time I was helping one of my friends train his puppy. During one of the training sessions I decided to bring along my Golden Retriever, Apache to not only act as a distraction, but to give him a chance to work on staying in a down position calmly with a puppy in the room. So what happened? Well, puppy training went well and when they first met we happened to capture a great shot of Alchemy (Siberian Husky puppy) yapping while Apache (my Golden Retriever) has a goofy look on his face. So I posted the picture in a few places…Facebook, Twitter, etc. and asked people to write the caption. After many responses we have a winner! Classic Pic! A Must See! A great picture of a little Siberian Husky puppy yapping at a full grown Golden Retriever with a goofy look on his face! The caption is spot on. 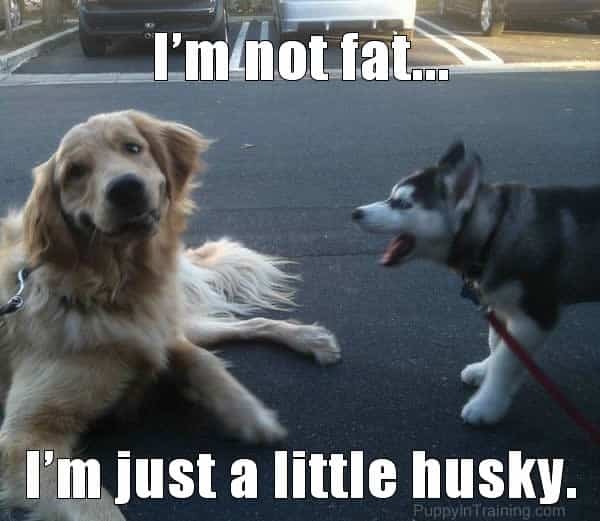 “I’m not fat…I’m just a little husky.” Love it! If you’ve thought of a great caption for this pic then please leave us a comment in the comment section below.